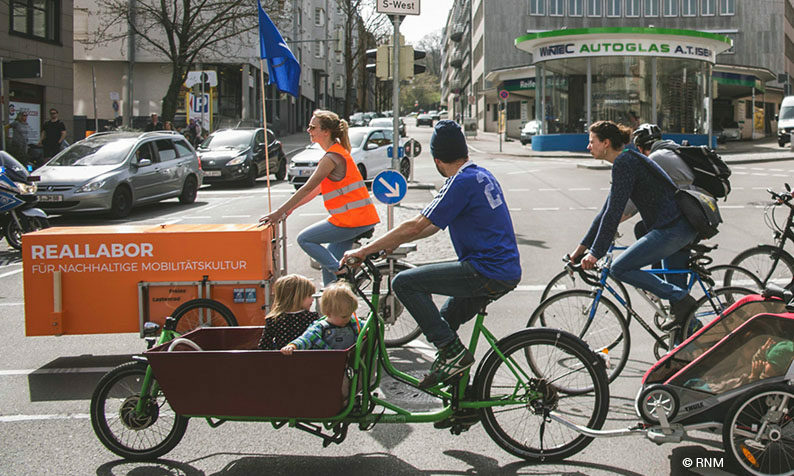 The Future City Lab – Reallabor for a Sustainable Mobility Culture research project aims to address the question of how to make mobility in the Stuttgart Region more sustainable. It is a joint venture between the Institute of Urban Planning and Design and the Institute of Landscape Ecology in cooperation with IZKT, ZIRIUS, ISV, INSPO, and IAT. Stuttgart is a city defined by cars. Here is where the first car was built and is currently the most significant automotive industry cluster in Europe (employing more than 30 percent of the regional workforce). Like many other European cities – after World War II – it was built to be car-friendly, and so, automobiles are an essential factor in the city’s identity. However, there is now a consensus to address the adverse effects of individual transportation and the dependency on the use of automobiles. The general opinion is to move away from the negative effects of traffic congestion, fine particle and CO2 emissions, unnecessaryland consumption, and noise pollution; and to move forward to a sustainable approach for mobility in the region of Stuttgart. With this in mind, how can we set the process in motion? Which direction should it take? Also, what role can local citizens play in actively shaping and enabling this process through social innovations? In acknowledging this, the Future City Lab Stuttgart holds that the cultural dimension is central in obtaining sustainable mobility. In order to develop it, different actors – such as the industry sector, the city administration, local businesses, and citizens– must jointly work together. The aim is then, not only to reduce resource consumption but also to promote health, social interactions, and further enhance the quality of life in the in the region and the city. Therefore, to bring together shared ideas, visions, projects, and gain from the practice of a sustainable culture for mobility a network of partners established The Realworld Laboratory for a Sustainable Mobility Culture. HOW CAN THE CITY BE A STAGE FOR COLLABORATIVE EXPERIMENTATION? Recently, the Baden-Württemberg Ministry of Science, Research and the Arts (MWK) initiated funding a new format of research known as “Realworld Laboratories”, which aims to provide a setting –within “real-world” contexts– to link science and society in collaboration. This new model of creating knowledge renders the city and ideal stage for Collaborative Experimentation. The approach is centered in bringing together researchers and citizens –and so, rather than merely focus on the observation of human behavior and human actions– it tries to develop actionable knowledge to complex challenges. Furthermore, it intends to develop “real-world” solutions from practical knowledge and to tackle the challenges that will face society in the future. Our Realworld Laboratory for a Sustainable Mobility Cultureproceeds as a Future Lab and as a digital platform. We seek to level knowledge, make it available to a broader audience, and build upon the developed dialogue; this makes for a comprehensive discussion both digitally –on the internet– as well as through the collaborative practice between initiatives and stakeholders. As a group, we try and address how peoples’ needs for mobility can be met now, to exercise their rights as individuals without compromising the future so further generations can also benefit from a healthy environment in which to live. Our focus then lies in creating a culture of mobility –rather than a technological approach for optimizing traffic and transport systems– and so, our strategy is to foment an active and healthy culture for mobility that may enhance the quality of life for people and create a prosperous city environment. WHAT KIND OF PROJECTS CAN PROMOTE A SUSTAINABLE CULTURE OF MOBILITY? Generally, experiments take place within the controlled environment of a laboratory. However, in “Realworld Laboratory”, the experiments take place within “real-world” contexts to explore the impact of new ideas within the city space in “real-time”. The “Realworld Laboratory” for a Sustainable Mobility Culture in Stuttgart gathers people around the topic of urban mobility, to understand what challenges they are facing and what possible solutions could be implemented and tried out in the form of a Realworld Experiment. We then measure the impact of these experiments on how they influenced the ecological, the technical, and the social dimensions. The Realworld Experiments have been implemented in the city of Stuttgart in collaboration with its citizens and the students from The University of Stuttgart through a public participation process and multi-stage sampling approach. In 2016, a competition opened, and six projects were selected to be funded, receive ongoing support, and monitoring. Furthermore, the public can keep track of the experiments as well as make contributions or play an active role in their progress and development. Ongoing workshops are also a modality for the public to engage with these Realworld Experiments and assess the success of the projects. The results also are open to the public so that they may be discussed. WHO IS ACTIVELY CONTRIBUTING TO A SUSTAINABLE MOBILITY CULTURE? One of the main aims of the “Realworld Laboratory” is to build new alliances between civil society, the market, and the state, and implement projects for the communities. The “Realworld Laboratory” as such is a forum to create new partnerships. This network of people include researchers from the fields of transportation planning and technology management, architecture and urban planning, sports sciences and, sociology. It also includes student initiatives, cultural institutions, local businesses, associations, federations and, different city and regional stakeholders, which comprises a vast group of actors that play an active role in the research process. Within this frame, the “Transformation Pioneers” play a unique role in the network. They are people in society who are actively developing and implementing social innovations and sustainable projects. Their actions are an inspiration for others to follow and have the potential to enhance our quality of life. We seek to encourage new projects and initiatives, strengthen the ties between them, and ultimately, reflect on the experiences gained through the Realworld Experiments. For more information please visit www.r-n-m.net.